In 1302, the townspeople of Flanders rebelled against the French, laying siege to the castle at Courtrai. The French sent an army of some 10,000 men, commanded by Robert of Artois, to deal with them. Rumours spread that the invading army was committing dreadful atrocities in order to terrorize the Flemings, killing the sick, women, and children. Aware of the coming attack, the Flemings prepared the ground, digging ditches so as to disrupt cavalry charges. The French knew what was happening; a man called Peter the Horrible sold them a map showing where the ditches were. Overconfident, they failed to draw the right conclusion: this would not be a battlefield for cavalry. The Flemings knew better, and drew up their forces on foot; even the knights with them dismounted to fight. Many in the French council of war were worried by the prospect of battle, but Robert of Artois was anxious to attack. The battle began with the crossbowmen on each side exchanging volleys. The Flemings had the worst of it, and were forced to withdraw back to their main line. The French infantry then trudged forward through the ditches and mud, and began to lay into the line of enemy troops. Robert of Artois, however, wanted a glorious victory, won by a triumphant cavalry charge. So he pulled back the infantry. The charge that followed was disorganised. There was a stream to cross, and many horses refused. Men and horses fell into the ditches. Those that managed to reach the tightly-packed Flemish lines were beaten down by men armed with pikes and the fearsome goedendags, long heavy clubs fitted with iron spikes, which crunched into armour and crushed skulls. Further waves of cavalry suffered the same fate. One writer described them as caught in a net, like birds in a trap, another as oxen going to slaughter. Most of the Flemish line held firm; one section was penetrated by the French, but the Flemings had a reserve under Jan de Renesse, which moved in swiftly to drive the enemy back. A final desperate charge by Robert of Artois achieved nothing. His horse was slain, and he pleaded for his life – in vain. 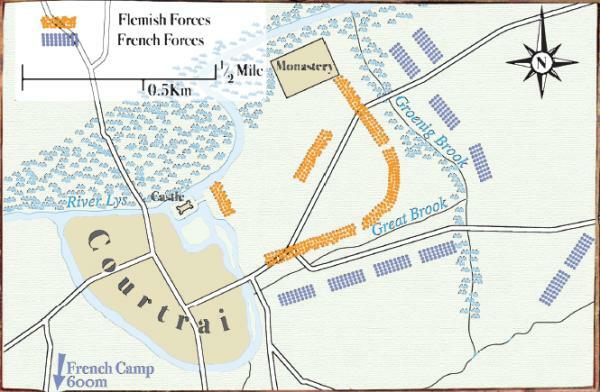 In the final stage of the battle, the Flemings advanced, killing any Frenchmen who had managed to survive. This was not a chivalrous battle in which the defeated were allowed to surrender honourably in order to be ransomed. It was a cruel massacre. The bodies of the slain were pillaged. There was no respect for the corpses, which were left to rot where they lay in the ditches. The flower of French chivalry had been plucked.